ORGANIZE life’s adventures with photographs and cards. DISPLAY your vision, plans and presentations to visually stimulate you and your audience. Brian Hall is inventor, founder and CEO of myPicboard, the patented display board that allows you to exhibit and organize your photos, memorabilia, inspirations and plans—beautifully and functionally. Available for purchase online and through select retailers, myPicboard also doubles as an elegant and contemporary piece of natural-wood wall art. 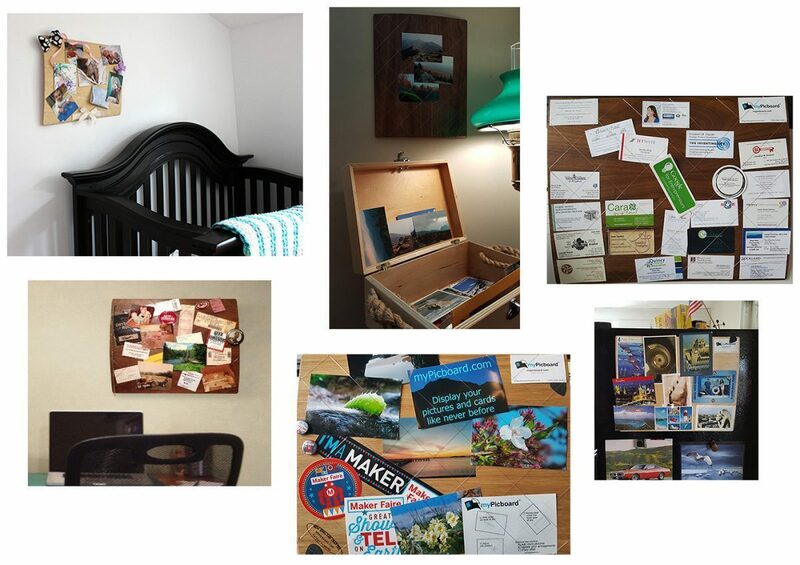 The idea for myPicboard originated in Brian’s home woodworking shop in 2013. He wanted to make something from the heart to give his nieces for Christmas – Why not a cool and useful display board for their photos? But first he needed to research. Looking in office-supply, craft and home-décor stores, he found flaws in all of the typical display boards and fine-art frames. Pin boards deface materials, ribbon-board grommets restrict movement, magnets are clunky, tape leaves scars, photo frames are one-and-done. Determined to solve these challenges, Brian built many prototypes before – eureka! – arriving at his now-patented engineering of fine, transparent line that holds elements flat and allows for easy placement, removal and repositioning. His nieces were thrilled to show off their photos without pinholes, and Brian knew he was onto something special. In recognition of Brian’s innovative product idea, craftsmanship, and business plan, myPicboard won the grand prize of Cape Cod Startup Weekend 2014, a global event. Brian has worn several hats over his three-decade career, including start-up leader, e-commerce expert, web project manager and fine/finish carpenter. Whether the task is digital or physical, his driving force always has been “to build things better,” he says. Woodworking is a lifelong love for Brian. Growing up in New Hampshire, he learned to operate a band saw as a preschooler, and later he spent 15 years working as a builder in New England and Hawaii. A career switch led him to digital project management, and from 2000 to 2014 he held senior IT positions with Havas Worldwide, Emagine USA, Keurig and Talbots. Today Brian runs myPicboard as well as Hallways International, a project-management consultancy with clients including Harvard Medical School, Northeastern University and MyWebGrocer. He also is a member of the Quincy Center for Innovation and Lowell Makes, a nonprofit community of artists, engineers, makers and thinkers. A resident of Hull, Massachusetts, he is a four-season, all-terrain outdoorsman who skis, boogie boards, mountain bikes, hikes and swims. On his bucket list: Ski all seven continents – yes, even Antarctica. Sneak peeks and Exclusive offer.